On Wednesday, I was on my way to work and while waiting for the 176. I saw this guy taking a pic of this strange car. I look closer and to my surprise, it was the google street car. It’s an awesome little car that is hard to see. 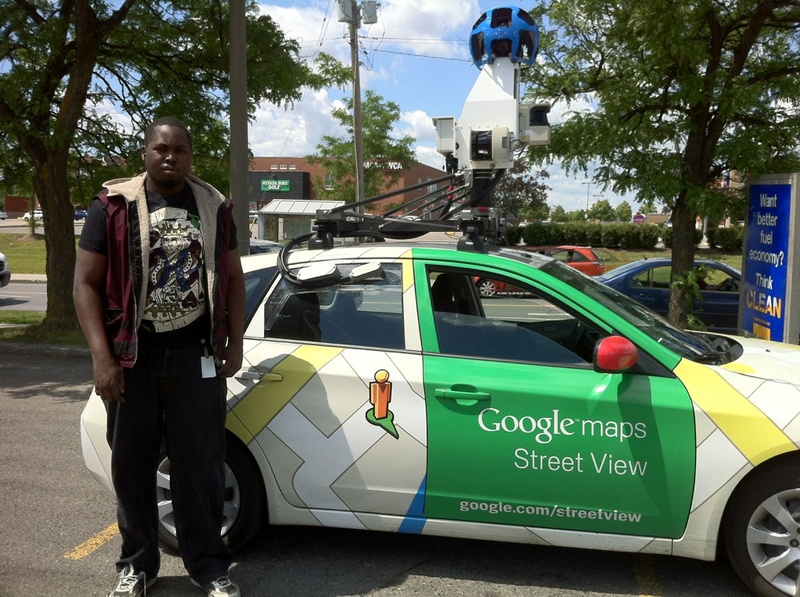 I grabbed a pic using my blackberry of just the car & I used some Esso employee let me use his Iphone to take a pic of me standing next to the Google Street car. I figure I’d show the better of the two. The one highlight of my Wednesday commute to work. That’s a cool little car. Great pic! Ya it is actually but I didn’t take that with my blackberry. Used some stranger’s Iphone. always wondered what those looked like. thanks, now I know! Yes, share the awareness. This poor guy up here(in canada) even said that google won’t even get him a shirt. I saw one too once. It drove slow and it blocked the road… I was late already. It must be an interesting job to drive that car and visit so many places you wouldn’t see otherwise. Don’t you hate that. Just when you want to see when you are late.